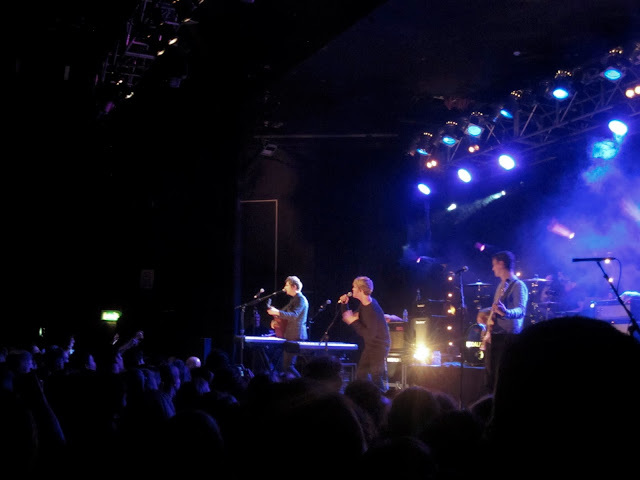 To say Kodaline have had a bloody great year would be a bit of an understatement. Signed to RCA on their demos alone and being nominated in the BBC's Sound of 2013 poll, not to mention their debut record reaching number 1 in the Irish Albums Chart, it's safe to say the band have well and truly been riding a high wave of good fortune over the last year. And as they begin to near the end of their UK tour it doesn't look like their about to slow the pace any time soon having sold out the majority of the dates. Arriving a little late due to a wrong turn (not taking the correct motorway junction, rather than getting eaten by cannibalistic mountain men like that rubbish horror movie) I sadly missed the first support act James Bay. By the time I did arrive Hudson Taylor were well underway, charming the Bristol crowd with their Folk-Pop melodies. The Irish duo, joined by a full band tonight to recreate the undeniably catchy rhythms, did a stellar job in warming up the crowd. It was clear to see they already have a pretty strong fan base with adorning fans singing along and it's safe to say after their performance tonight they've most definitely earned some more. With crystalline vocals and delicately plucked guitars Hudson Taylor are a fine example of musical perfection. For once, it was nice to be amongst a calmer crowd. Having been to my fair share of laddish gigs in recent months, not having to fight for my life as the normality of swaying to-and-fro on the verge of being crushed was a welcomed experience. With the audience made up of an odd cross section from students to middle aged adults it's clearly evident just how widespread Kodaline's musical fan base is. As the lights finally dim and the crowd erupts in to a roar, the Irish four-piece take to the stage as they kick off with After The Fall. With the vocals sounding a little muddy on the opener a few nods to the sound technician quickly remedied the problem just in time for the empowering rendition of Pray, beautifully demonstrating Stephen Garrigan's ability as he breaks in to an almost falsetto styled vocal range. I often find with a more chilled out crowd the band have to work extra hard in order to fill out the atmosphere but there's no fear of that here. People might not be throwing beer and piss. They might not be pushing their way past others to get to the front. But they sure do know how to sing and have a good time. As the evening progressed it's obvious to see that Kodaline already have an impressive array of songs under their belts. With their passion so evidently displayed on stage as they worked through the setlist in an expeditious manner the music really did become alive. As thunderous drums echoed around the room, hearing Garrigan breath life in to the raw and obliterating lyrics really made them hit home. Painstakingly beautiful and with his heart firmly worn on his sleeve as he switches between playing guitar and piano the band so effortlessly demonstrate once more the true artistry we've grown to love. With the majority of the set list made up of tracks from the band's debut album 'In A Perfect World', for the encore they took to the balcony to perform a glistening acoustic rendition of Sam Cooke's Bring It On Home to Me. Rounding up on the fantastic The Answer and ever popular All I Want their ability in capturing the true emotions in their low-key verses and fully fledged chorus's has been nothing short of mesmeric. A roller coaster ride from beginning to end. I'm sure 2014 has big things planned for this Dublin foursome.